Sporotrichum is a filamentous fungus widely distributed in decaying wood and soil. It is commonly considered as a contaminant. Phanerochaete chrysosporium is the telemorph of Sporotrichum pruinosum. The only active species included in the genus Sporotrichum is Sporotrichum pruinosum. See the summary of telemorphs, synonyms and obselete names for the Sporotrichum sp. No diseases due to Sporotrichum have so far been reported. However, Sporotrichum pruinosum has been isolated from the respiratory secretions of some patients. This finding may suggest that colonization of the bronchopulmonary tree with Sporotrichum pruinosum is likely . Also, the organism was shown to produce giant, thick-walled chlamydospore-like structures similar to the adiaspores of Emmonsia parva in tissues . Colonies of Sporotrichum pruinosum grow rapidly and mature within 5 days. The texture is velvety to powdery. From the front, the color is initially white and then becomes rosy beige, pinkish, yellow or orange. From the reverse, it is tannish [1295, 2144, 2202]. 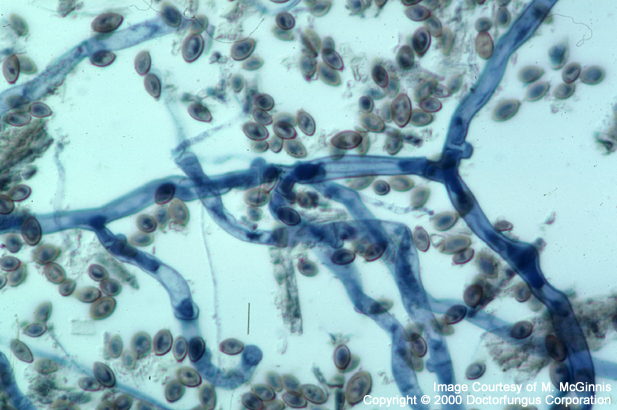 Septate hyphae, conidiophores, aleuriconidia, arthroconidia, and chlamydospores are observed. Hyphae contain clamp connections (bridges) at the septa. Conidiophores may be short or long, simple or branched. These conidiophores bear the aleuriconidia. Aleuriconidia (6 x 10 µm) are unicellular, oval to ellipsoidal in shape, golden yellow in color, smooth or rough, and thick-walled. They are often terminal and have a truncated base. The aleuriconidia usually retain a portion of the conidiophore (“annular frill”) after seperation. Arthroconidia are plenty and found in clusters. Chlamydospores are large (up to 60 µm in diameter) and thick-walled. They are produced at 25°C as well as 37°C [1295, 2144, 2202]. Sporotrichum differs from Chrysosporium and Sporothrix by the typical clamp connections and thick-walled, unicellular, golden yellow conidia with annular frills. It differs from Sporothrix also by not being dimorphic. Sporotrichum differs from Emmonsia parva by producing (adiaspore-like) chlamydospores not only at 37°C but also at 25°C [2144, 2202].